A new study shows who owes the most money on their student loans, and where they live across the nation. Washington residents fare well compared to the national average. Americans owe nearly three times as much in student loan debt today as they did a decade ago. A new national report sheds light on how much the residents of every county in the U.S. owes, and it also hints at what might be driving the numbers. Compared to the rest of the nation, Washington does fairly well in terms of student debt, according to “Debt in America,” a study by The Urban Institute. Its median debt of $16,211 is below the national median of nearly $17,000. 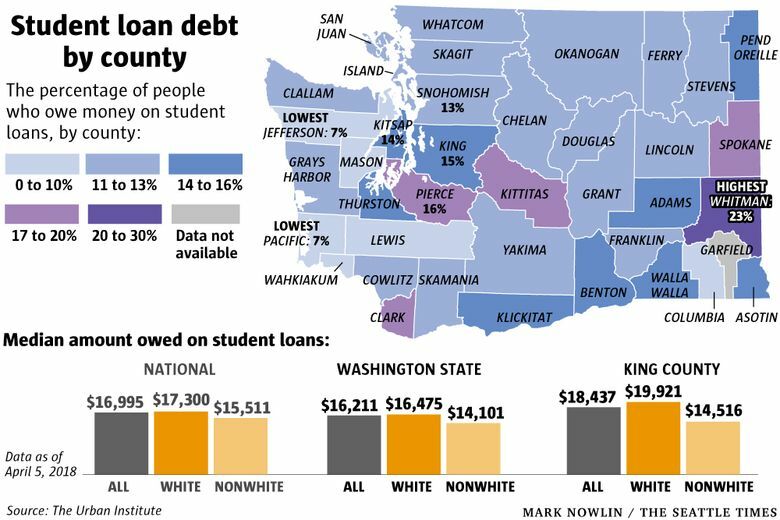 About 14 percent of Washington residents owe debt on college loans; the share of the national population with student-loan debt is 16 percent. That matched other findings that the study revealed about states in the West. Western states — especially New Mexico, Wyoming and California — have the lowest median student debt, which correlates to low public-college tuition rates. Washington has done a good job of keeping public tuition fairly low, said Sandy Baum, who co-authored the report. Baum, a nonresident fellow in the Education Policy Program at the Urban Institute, noted that Washington also puts a substantial amount of money toward student financial aid that goes to the lowest-income students through the State Need Grant. “But that doesn’t mean there aren’t a significant number of people who are struggling to repay their debts,” she said. The report shows that in Washington, 14 percent of people with student-loan debt have defaulted on their loans and are now in collections, said Caroline Ratcliffe, a senior fellow at the Urban Institute, and Baum’s co-author. That’s slightly higher than the national average of 13 percent. “Clearly, there are people who are struggling to pay off that debt,” she said. In this year’s legislative session, lawmakers passed a number of bills that addressed student loans, including one that created new student-loan consumer protections. The amount of money Washingtonians are paying varies significantly by county. But in Whitman County — which includes Washington State University’s Pullman campus — the debt is much higher. The median student-loan debt there is about $21,000. About 23 percent of residents have debt. On the other hand, only about 9 percent of Whitman County residents have defaulted — significantly below the state average of 14 percent. The study’s authors weren’t sure what set Whitman County apart, but they said not all college-debt issues play out the same way. For example, students may borrow tens or even hundreds of thousands of dollars to go to graduate school — but grad-school students are much less likely to default on their loans. On the other hand, students who start college and never finish a degree are far more likely to default, Baum said. The study found that the share of college enrollees borrowing in a state was highly correlated with the cost of attending a public four-year college in that state. For example: New Hampshire, a state with high student debt, charges a high tuition rate for its four-year public schools. Wyoming, a state with low student debt, does not. Washington raised state tuition prices by double-digit amounts during the Great Recession, then did an about-face in 2015, lowering state tuition costs by as much as 20 percent, depending on the college. The state Legislature’s bill to lower tuition also tied future tuition increases to the state’s median family wage, which has been increasing by a rate of less than 3 percent per year.